12-ounce packages of “Zeigler Wieners made with Chicken and Pork, artificially colored.” Each package bears the use-by-date of “November 26, 2008” and the establishment number “P-9156S” inside the USDA mark of inspection. 12-ounce packages of “Vacuum Packed PAR-TI PUPS.” Each package bears the use-by-date of “November 26, 2008” and the establishment number “P-9156S” inside the USDA mark of inspection. 12-ounce packages of “Zeigler Original Recipe Wieners, artificially colored.” Each package bears the use-by-date of “November 26, 2008” and the establishment number “EST. 9156S” inside the USDA mark of inspection. 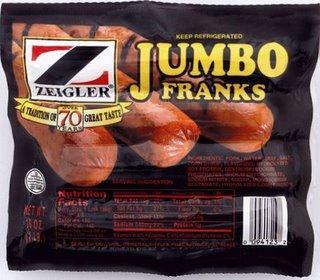 16-ounce packages of “Zeigler Jumbo Franks.” Each package bears the use-by-date of “November 21, 2008” and the establishment number “P-9156S” inside the USDA mark of inspection. 12-ounce packages of “Zeigler Hot Dogs.” Each package bears the use-by-date of “November 26, 2008” and the establishment number “P-9156S” inside the USDA mark of inspection. 10-pound bulk boxes of “Skinless Wieners, 8 Wieners per lb.” Each box bears the package code “PK 092208A” and the establishment number “EST. 9156S” inside the USDA mark of inspection. 10-pound bulk boxes of “Skinless Wieners, Artificially Colored, 10 Wieners per lb.” Each box bears the package code “PK 092208A” and the establishment number “EST 9156S” inside the USDA mark of inspection. 10-pound bulk boxes of “Skinless Wieners, 10 Wieners per lb.” Each box bears the package code “PK 092208A” and the establishment number “EST. 9156S” inside the USDA mark of inspection. 10-pound bulk boxes of “Skinless Wieners, 12 Wieners per lb.” Each box bears the package code “PK 092208A” and establishment number “EST. 9156S” inside the USDA mark of inspection. To date, there have been no reported cases of Listeria illness associated with consumption of the recalled Zeigler products. Listeria monocytogenes is a bacteria which can lead to a food-borne disease known as “Listeriosis.” Listeria can invade the body through a normal gastrointestinal tract. Once in the body, Listeria can travel through the blood stream and produce toxins that damage cells. Listeria invades and grows best in the central nervous system among immune compromised persons, causing meningitis and/or encephalitis (brain infection). In pregnant women, the fetus can become infected, leading to spontaneous abortion, stillbirths, or sepsis (blood infection) in infancy. Approximately 2,500 cases of Listeriosis are believed to occur in the U.S. each year, with about 20% of these cases proving fatal. Certain groups of individuals are at greater risk for Listeriosis, including pregnant women (and their unborn children) and immunocompromised persons. If you need a Georgia food poisoning lawyer, or you have contracted Listeriosis or any other food-borne illness due to consumption of Zeigler wieners or any other contaminated food product, you should contact us in Atlanta at (770) 407-7300 or toll free at (866) 526-5891. Attorneys at Ragland Law Firm, LLP have experience with handling cases on behalf of consumers who suffer Listeriosis or other food-borne illnesses due to contaminated or negligently prepared food.